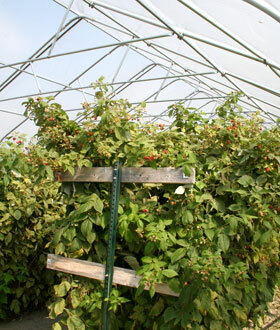 Why a Greenhouse to grow Raspberries? There are some specific advantages to growing raspberries in a greenhouse over field grown berry’s. First, raspberries have a relatively low chilling requirement for over-wintering, about 45 days below 45°F. 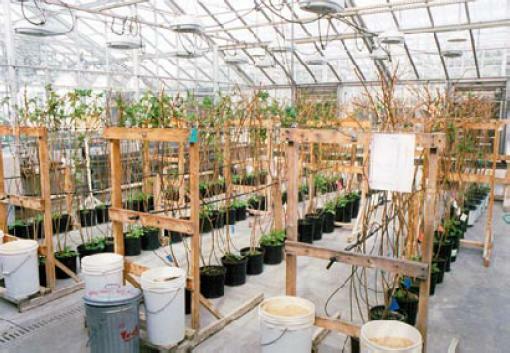 Then the plants can be brought into the greenhouse from the cold to bring them out of dormancy early. They also prefer cool growing temperatures (55°F to 70°F), so the cost of heating the greenhouse is less than it would be for other crops. Growers in areas that winter begins early, have the added advantage of satisfying the chilling requirements (over-wintering) earlier. Those in warmer claimants may find it beneficial to use a separate chilling room to speed up the process. Also in most locations they don’t need supplemental lighting to produce high yields. One study did a test using both supplemental light and without. The plants with supplemental lighting began to flower 2 weeks earlier, but the total yield over the season (about 4 months) was just about even for both tests. Another advantage to growing raspberries in a greenhouse is that greenhouse plants are not subject to the foliage and berries getting wet by rain or dew. Wet raspberries are very susceptible to rotting, and damaged berries are useless and won’t sell. So just by using a greenhouse to grow them in, you will significantly increase the profitable/usable yield of your plants. 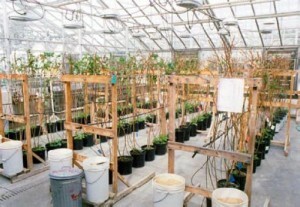 Greenhouse raspberry plants are typically watered via-drip system whether they are grown hydoponically or not. But growing them hydroponically significantly reduces the possibility of soil born diseases being introduced to the root systems, provided they were certified virus indexed plants to start with, resulting in healthier plants. Because the fruit has been kept dry (out of the rain and morning dew), the storage and shelf life of ripe raspberries (under refrigeration) is greatly increased, thus stays fresher longer for the consumer. In addition, many of the insects/pests that can be a problem during the summer months are not active during the off season in the cold winter months. Even with all the requirements that raspberry plants have (size, trellising, chilling etc. 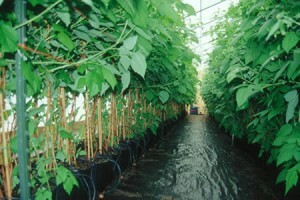 ), they have been grown in practically all types of hydroponic growing systems, even NFT, DWC and Aeroponic. Some growers may even use grow bags full of growing medium, and simply cut a slit in the bag to insert the plants in and use a non recovery drip irrigation system. A well fed raspberry plant doesn’t necessarily have a large root system for it’s size, it can be even smaller than that of a mature tomato plant, but still last for years. As always hydroponic growing medium is mostly a personal choice, however it’s important to make sure the growing medium drains well and doesn’t remain to wet. 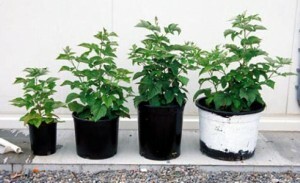 Typical growing mediums used for raspberries by most growers include: sand, vermiculite, peat and perlite, either by themselves, in equal parts, or in just about any combination of them. Probably the most common type of hydroponic system to grow raspberries in is a drip system. Either as a recovery ,or non-recovery system (also called run to waste). Non-recovery simply means that the nutrient solution is not returned back to a central reservoir, but is allowed to run off. Depending on the size and age of the plant, growers use buckets starting from 3 gallons and transplanting into larger buckets up to 7 gallons as they get bigger. All the plants energy is stored in the roots, so make sure to take care to do as little damage as possible to them when transplanting if doing so. Also make sure not to let the roots dry out before, during, or after transplanting. To determine how many raspberry plants can fit in your greenhouse, just calculate how many plants you can fit in a row, spacing them two feet apart. For floricane-fruiting plants, determine how many rows you can have with about 5 1/2 to 6 feet between rows, remembering to leave at least 3 feet between the end rows and the greenhouse walls (for harvesting etc.). Rows for primocane-fruiting varieties can be spaced closer, at about four feet apart. Closer spacing can result in pour air circulation that can lead to disease. Growing Raspberry plants using hydroponics gives the grower maximum control of the plants nutrition, and naturally quality. According to one study raspberries grow better with a higher proportion of N relative to P and K. Another study used the same nutrient formula they used for strawberries with very good results. Raspberry’s are a crop that can tolerate low light levels, and even lots of cloudy days. So even though supplemental lighting may increase a yield somewhat, the cost of running the lights may out-way any increase in yield from of using them. Not to mention, considering the add expense of installing them if they were specifically installed for the raspberry crops only. Raspberries thrive in cool climates, with the optimal daytime temperatures around 72°F, and nighttime temps around 55°F to 60°F. But like any plant, they can tolerate and adapt to higher or lower temps, as well as fluctuations. The optimum humidity range is between 65% -75%. Humidity levels above 90% will encourage fruit molding and pour pollination. Humidity levels below 65% will encourage mite infestations as well as pour pollination also. 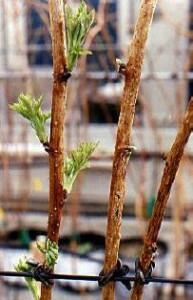 A supporting trellis system is an important part of good raspberry production. As the fruiting laterals become heavily weighted down with berry’s and foliage, they will tend to bend over and break from the weight. Once the growing season is over all the leaves can be trimmed off, and the old canes can be pruned off as well. Pruning and trellising will affect plant growth, fruit quality and quantity, as well as size. So you should get to know your canes. Unfortunately pollination is probably the biggest drawback to greenhouse and off season production of raspberries for most growers. Unlike some crops that can be pollinated by shaking the plants, air currents and a just a good breeze, raspberries need to be pollinated by insects. More than 30 flowers can be produced by one single fruiting lateral, and most buds that reach 2mm continue to develop, set fruit and mature. Insect pollination is essential for good fruit set. Hand pollination is to labor intensive, not to mention to hard to keep track of which flowers were pollinated to be cost effective. For summertime crops, some greenhouses may be built with openings that allows outside bees to come inside to pollinate. But depending on the size of operation that may still be inadequate to pollinate all the flowers, although a beehive can be brought into the greenhouse for adequate pollination. For the home grower, planting flowering plants around openings in the greenhouse will attract bees inside to pollinate the raspberries. For off-season (wintertime) crops, most bee hives are inactive, especially in northern areas. Even inside a greenhouse it may not be warm enough for bees to be active enough, even above the optimal temp for raspberries of 72°F. Bumblebees are very good pollinators, and remain active in much cooler temperatures than bees. They are also quite docile and wont sting unless provoked. 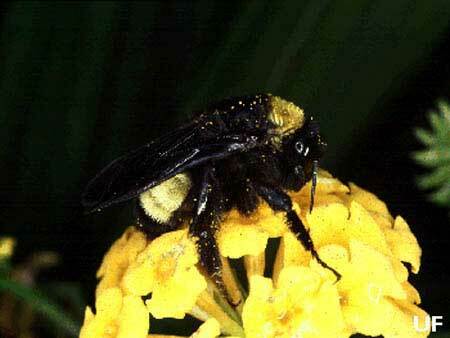 But bumblebee hives don’t have a long life-span like bees do. Bumblebee hives will last about 10 to 12 weeks or so. Depending on the variety of raspberry and if your staggering the production cycle or not, you may need more than one bumblebee hive to pollinate your crops. The stigmas of the flowers may only remain receptive to pollination for about 6 days or so, so it’s important to have your pollinators ready when the flowers begin to open. For growers serious about raspberry production, it may be well worth their while to learn to raise bumblebees themselves, especially for year round production. Along with bees and bumblebees as pollinators, Blue Bottle Fly’s are a recent option for pollination. Like bumblebees the blue bottle fly’s will remain active in cooler temperatures than bees will. 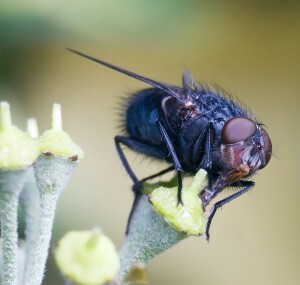 Blue bottle fly’s are also suited for use in greenhouses. They don’t like to stay in one place, and tend to fly off. But work well in confined spaces like a greenhouse environments. It’s important to remember bees, bumblebees and fly’s are all insects also, the use of pesticides will have a negative effect on them as well. Most growers are learning that the use of beneficial insects for pest control will still allow them to be able to control the pest populations, as well as not effect the other beneficial insects like the important pollinating insects.